Ballpark Breakdown: Named after 1934 alumnus E.R. “Red” English and his wife, Ruth, English Field is set next to the other athletic fields and Lane Stadium on the campus of Virginia Tech. It was dedicated on April 8, 1989 and the first game was played on March 22, 1989 against George Mason University. Getting to the park can be a bit confusing as there are no parking lots adjacent to the stadium. After driving around a bit, we noticed a small yellow sign down the street that pointed to a lot for “Baseball Parking”. Upon entering the lot, we discovered there were numerous signs warning that you would be ticketed for parking in the wrong spot, but there weren’t any signs directing you toward where you could actually park without getting a ticket. We picked a spot in the middle of the lot and took our chances (update: no ticket!). After a short walk up the hill to the entrance we were happy to find out that there was no charge for the game. The first thing you come upon after entering the ballpark is the small two-story press box that also houses the concession stand and the restrooms. 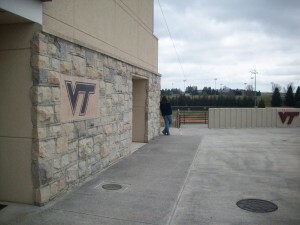 The first level of the press box is covered with stone, which matches the façade of the park with Lane Stadium and many of the other buildings on the Tech campus as well. Here they have also designed a small plot of shrubs that contains a bust of “Red” and a plaque unveiled when the field was first dedicated. 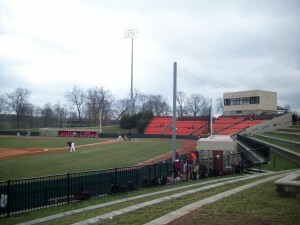 The stands are made up of 1,033 orange permanent chair-back seats, a small grandstand behind home plate, and handicapped seating areas behind the rows on both sides of the field. As it was a brisk March afternoon when we took in a game, there were plenty of seats available. The most unique aspect of this ballpark is the terraced seating along the third base side. 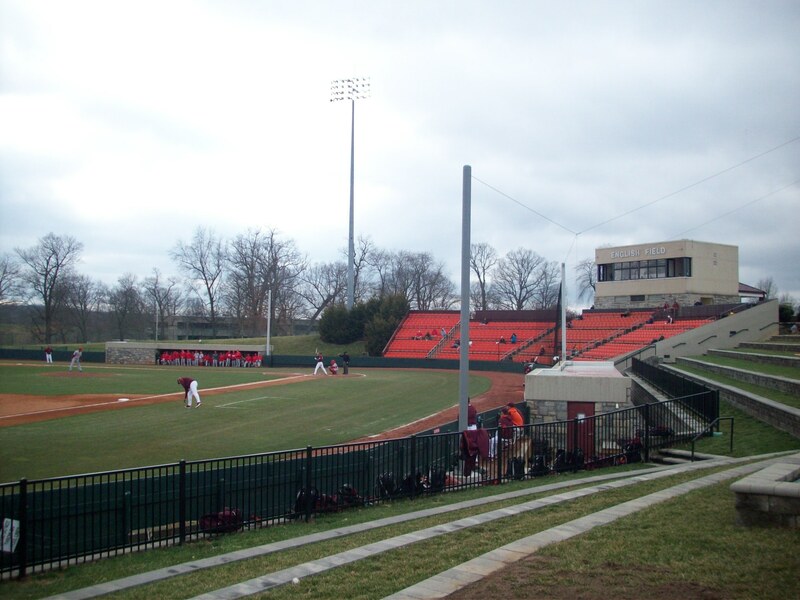 Completed in 2008, the seating is similar to that you would find in an amphitheater and is a great place to bring a blanket and watch the game. Even on this day with open seats galore, there were a handful of people who brought their own chairs, and even a mom with her son that had brought a blanket to watch the game from this vantage point. 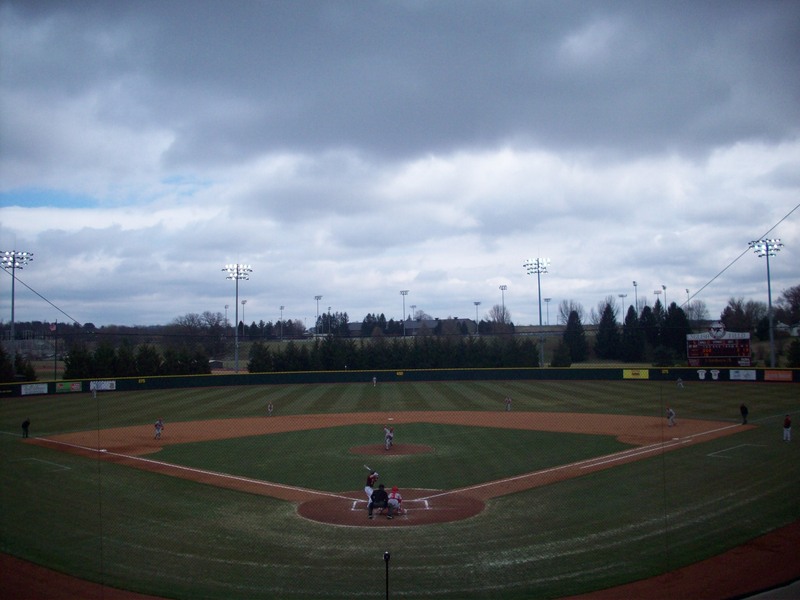 Overall English Field is quite on par with other ballparks at this level, and exactly what you would expect to find on a large, modern university campus. 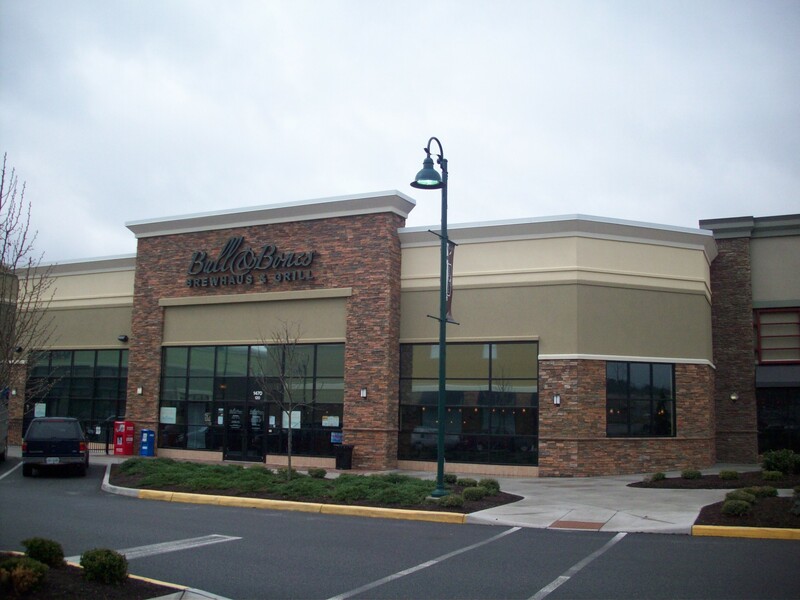 Brew Basics: Don’t judge this book by its strip mall-esque cover. We were fairly suspicious of this place without ever stepping foot in it. I think it started off with the name. With a name like Bull and Bones, Jim thought it seemed to focus more on the food than the beer, Gillian just thought that name sounded like one of those secret ivy league societies. Then to discover that it was housed in a new strip mall, we were even more convinced that we were about to walk into a Gordon Birsch spinoff. Nevertheless as dogged reporters, we bravely shouldered our wariness, went inside and ordered a sampler. When you first walk in the first thing you see (behind the host stand) are the 10 barrels that make up the brewery part of the establishment; which form a sort of barrier between the two distinct parts of the restaurant. To the right is the dining room with booths and tables and low lights. On the left is the sports bar section with a long bar, seven pool tables and numerous HD TV’s, including two large ones flanked by four smaller ones in the front. 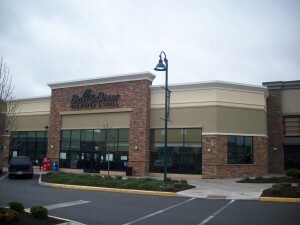 One would assume that the noise from the sports bar would disturb the patrons trying to have a romantic dinner in the dining room section, however, it didn’t seem to carry over, and the dining room section actually had an intimate feeling. The plan has seemed to work. Although we had ventured in on a Tuesday night, there were large crowds on both sides of the restaurant, and a large range of activities –couples eating romantic dinners, groups of friends getting together, plenty of people watching college basketball on the TV’s, and several groups shooting pool on one of the many tables. This dual concept has been so successful; they have actually opened a second location at the clubhouse of a local golf course. The bartenders were attentive and very helpful but not nosy and intrusive, and little touches like a lane of ice that ran the length of the bar, and slowed the warming of your beers add to the atmosphere of the place. Overall, all the beers were delicious, and we were impressed with their IBU’s really were really all over the place, running the gamut of the entire rating scale, just another way this place has something for everyone! Sun Lit Wit (4.5 ABV/15 IBU) – an unfiltered Belgian, with a strong aroma. This style has mostly front loaded flavor, and enough carbonation that it almost makes your tongue tingle. All Nite Light (4.8 ABV/11 IBU) – The most basic of any of the beers here. Very, very light in both color and palate, but it’s as advertised, and always nice to have a lighter craft brewed option. Lunch Pale Ale (5.0 ABV/35IBU) – This California style pale ale is named as a tribute to nearby Virginia Tech football’s lunch pail defense and has a great coppery amber color. While not terribly overpowering in either taste or smell at first, the hops come through in the swallow, and leave a clean finish for this easy to drink, lighter option. Strick’s IPA (7.1 ABV/72 IBU) – Hop heads rejoice! This heavily-hopped, toffee colored beer hits upfront with an initial bitterness that mellows slightly, but is thoroughly full flavored throughout. The hops are equally pronounced in the aroma, so this beer deserves some consideration instead of just being tossed back. St. Maeve’s Stout (4.8 ABV/44 IBU) – Basically, it was good. Very smooth, and dark. This thick beer isn’t terribly carbonated, and as is also typical with stouts, has a great coffee smell, and malty goodness. Dark Lager (6.2 ABV/19 IBU) – This beer looks like a stout and tastes like a lager. It did have the deep tones of a stout or even a porter, but more of a faint aroma and strong toffee notes in an otherwise typical lager taste. It is a bit deceiving however; as the hops are very subtle don’t come through in the palate until the end.